Looking for a cheap flight from Nelson to Wellington (NSN-WLG)? Before you book a flight you can use Utiket to find the cheapest flights from Nelson to Wellington for Air New Zealand. All flight data are real-time and accurate. Utiket finds all the cheapest flights from Nelson to Wellington. On average the flight time between Nelson and Wellington is about 35 min. There is no time difference between these cities. The timezone for both cities is: UTC +12:00. The local time now: 02:12:43. There are 1 airlines flying from Nelson to Wellington. Weekly there are 6 flights between Nelson to Wellington. The earliest flight from Nelson to Wellington is at 09:10. The Nelson Airport is located about 8 km southwest of the city of Nelson on the South Island of New Zealand. With over 700.000 passengers a year Nelson Airport is in the top ten of busiest airports in New Zealand. Nelson Airport is also one of the quickly growing and passengers are expected to exceed a million in two years. A new terminal building is about to be constructed to replace the current one, which is too small to handle the growth and is deemed to be an earthquake risk. From Nelson there are multiple flights a day to Auckland, Christchurch and Wellington with Air New Zealand Link. Other airlines like Air2there, Jetstar airways and Kiwi Regional Airlines also have operations here. There are about 60 flights a day at Nelson Airport. 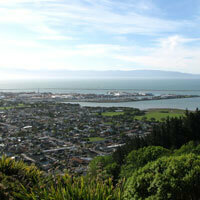 Find cheap flights to Nelson or read more about Nelson Airport. 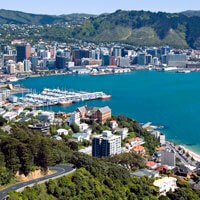 Find cheap flights to Wellington or read more about Wellington International Airport.